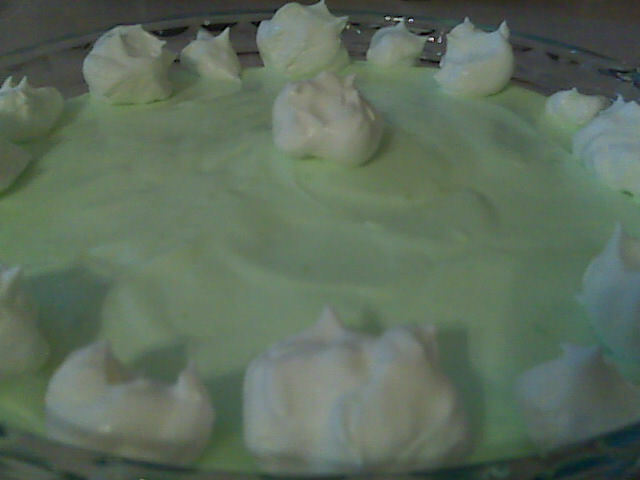 It’s not really key lime pie but it sure does taste like it. So good for those times when you really want some pie. You see I have two types of pie that I love…and I mean loooooove. I can be so won over by either a key lime pie or a strawberry rhubarb pie. I know…I’m shameless. It’s all about those two pies for me. So you can imagine how pleased I was when I cam across this idea while perusing the internet. One thing about the recipe made me sad though, it had no fiber. I fixed that with a quick change of the crust. So while this one is not entirely my recipe, it is instead my flair on this one to make it even healthier for all its perceived indulgence. Crush the cereals together. I used a blender to get it down to crumbs. Sprinkle on the bottom of a pie plate. Nope, no butter needed. The pie will bring it together. Dissolve the jello in boiling water using a whisk. Stir in the yogurt, and then fold on most of the cool whip. I reserve a few tbl spoons worth of the cool whip to decorate the top as seen in the picture. Transfer to the pie plate and refrigerate for at least 2 hours or more. Serves 8. Each serving has 98 calories, 1.4 grams of fat, and 1.5 grams of fiber. I didn’t stutter…yes, that is 98 calories. Sooo again…you could reach for one of those tiny prepackaged 100 calories things…or have a slice of easy to make keylime pie. I know which one I’m having. Mmmmmm. This entry was posted in Craving Buster, Dessert and tagged pie. Bookmark the permalink.